The "PLUS" MicroSD cards are the ones we'd recommend - they're considerably slower than the more expensive "PRO" models, but for expanded storage in a phone or tablet, you really don't need screaming speeds. At up to 48MB per second, these should be more than adequate for movies and music. 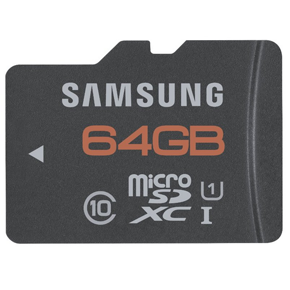 The best deal of the lot is probably the 64GB PLUS Micro SDXC card, discounted by $19 to $35.99. Step down to the 32GB SDHC version for $17.99 (a $25 discount), or a more sober 16GB version for $9.99 ($12 off). If you feel the need for speed, the PRO cards can read at up to 70MB/s. These are the ones you want if you have a phone or tablet with the capability to use apps and games from removable storage. The 64GB model is fifty bucks, exactly half off. The 32GB model is $24.99, an impressive $40 off. And the 16GB model is just $14.99, a full two-thirds discount. All of the cards in today's sale come with the typical full sized SD card adapter, and Amazon Prime subscribers can get free two-day shipping and discounts if you want your stuff even faster. Photographers, there are standard SD cards on sale as well. Amazon's Gold Box deals are for one day only, and they tend to go out of stock quickly, so get your order in soon if you want one.